Amsterdam's heavy, punked-out, proto-metal outlaws DEATH ALLEY have signed to NYC's Tee Pee Records. The ferocious four piece will let loose the full length LP, Black Magick Boogieland, on May 19. 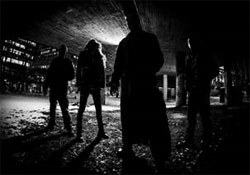 The album is the highly anticipated debut from the underground band featuring former The Devil’s Blood guitarist Oeds Beydals and ex-members of Gewapend Beton and Mühr. The sound of DEATH ALLEY has been described as "an unorthodox cross contamination of MC5, Captain Beyond, Blue Öyster Cult, Motörhead and Black Sabbath" and "Rock ‘N' Roll played with metal finesse and a pitch black psychedelic soul". In 2013, DEATH ALLEY released the limited 12" split vinyl single, "Peter Pan Speedrock vs. Death Alley", which announced the group's formation with a vengeance. The band's debut 7" -- Over Under b/w Dead Man’s Bones -- dropped last year via Van Records and was hailed as "a serious musical Rock ’N' Roll statement." DEATH ALLEY followed the release of the 7" with an appearance at the 2014 Roadburn Festival and month-long European tour with new label mates, The Shrine. "It’s thrilling to release our first full-length on Tee Pee, to become part of a family of bands whose music inspires us and with people we know well," says DEATH ALLEY front man Douwe. "It's about time Tee Pee opens the gates to Black Magick Boogieland." More information on DEATH ALLEY's Black Magick Boogieland, including new music, will be issued soon. Stay tuned to TeePeeRecords.com for breaking news and updates. After their last release "The Gift Of Life" (2013) and a tour which led them through all Europe, USA, South Africa and Russia, the Dreamshade boys are now back with a new and powerful single entitled “Dreamers Don’t Sleep” and a new tour! The track, produced by Dreamshade & Jacob Hansen, will be digitally released worldwide on March 2nd 2015 through Japan's Zestone Records and it will be presented with a new Music Video directed by Andrea Todaro. Fernando (Guitars, Vocals, Songwriting) comments: “Dreamers Don’t Sleep will give you a little taste of the new sound we are currently experimenting in the studio and it represents for us a bridge between “The Gift Of Life” and what our new chapter will be like." Kevin (Vocals) comments: "We always want and love to add new elements to our sound: This single is very positive and energetic. We want to dedicate it to all the "Dreamers" who are supporting us everyday. Dreamers Don’t Sleep is an invite to never give up on your dreams and to stop having fear of what you may not accomplish, because you could seriously regret it one day. Dreaming is what makes us alive and real, it's a very personal experience. Each of us is a Dreamer is his/her own way and has fantasies, ideas and thoughts which are stuck in our hearts and minds. We are shaping our Future everyday: it's about choices, big or small, we all make along the way." Crawling out from beyond the putrid grave, of the cemetaries of Hornstull/Stockholm! Chris (ex-Kaamos, ex-Grave, The Resistance) and Tomas (Nale, ex-Chaosys) cracked their heads together and started jamming in early 2014 and with the combined worship for old school swedish death metal they had a couple of songs made. As the year flogged on Nille (ex-Siebenbürgen) joined the ranks as the lead guitarist. More songs where done, and the first ones where "polished" and perfected. Later on Matte (Nale) took on the bass duties to complete the band. The demo "Behold The Beheaded" (check it out: soundcloud.com/lik-official) was made and sent out to very few labels. Just to see if anyone would even touch the tunes of LIK. War-Anthem Records took LIK under their wings. And the future holds the debut album "Mass Funeral Evocation" soon to be unleashed upon the feebleminded. Stay tuned! Something BIG is coming..."Tunguska", the 2nd album of Hamburg´s finest SHAKHTYOR will blow away every fan of intense, deep and massively heavy stuff! The album will be released in spring 2015 by Cyclone Empire. This is the brand new video from Cruachan, taken from the new album. The video was shot in Dubiln, Ireland by Angel Croiter (Puka productions). The video features George Bracebridge as the main Shaman, George is a professional actor currently appearing in various Irish TV productions including TV3’s new crime drama “Red Rock”. Also featured is Rachel Lally as the Chieftans wife, Rachel is a professional actor and model from the Assets modelling agency in Ireland, she also presents “County Matters” for Irish TV on Sky 191. Lifted from the band’s widely acclaimed 2014 return, ‘Planet Satan’, the debut video ‘The Ether’ is complete. In the true spirit of Mysticum do not expect the typical kind of video, but instead a dark & cosmic trip, & a powerful glimpse into the all-conquering Mysticum universe. Hail Satan! A work of intense and otherworldly black metal power injected with Mysticum’s strong cosmic, satanic and psychedelic overtones, ‘Planet Satan’ welcomes Mysticum to the new millennium with full & unrelenting force, whilst retaining the core elements which made the Norwegians pioneering legends of industrial black metal. Both infernal & nihilistic, as well as apocalyptic in its scope and execution, ‘Planet Satan’ is a new milestone for the genre in its sublime, chaotic ferocity. Primitive minor-chord riff patterns & tortured vocals mixed with the band’s manic and often unconventional programmed drum beats makes this an eerily hypnotic work of the darkest order. A brand new videoclip from Spanish Doomsters AUTUMNAL is available now! Check out "A Tear From A Beast" at this location: www.youtube.com/watch?v=OiUWPlK-aV4. The band's current album "The End Of The Third Day" was released in October 2014 through Cyclone Empire. PERFECT BLUE SKY release track from the album "Emerald"
'Aquaria' is the first track highlight from the album 'Emerald'. As an eight minute trilogy, it sets the tone for the creative playground that is Perfect Blue Sky, where Kitto's chameleon vocal is woven into Andersson's song craft wizardry. The song is the haunting love story of the creative muse, the agony and ecstasy in nurturing a dream, something that Kitto had managed to capture in poetry on the remote Greek isle of Tilos last year. "Emerald" will be out in february. Check out the first ever official video of German Death-Doomers OPHIS at this location: http://youtu.be/jLE8FCn6BzE?list=UU8Jz40RmGbB6axn1rZq0viQ! The clip was created by Harddrive Media. "Among The Falling Stones" is taken from the band's current album "Abhorrence In Opulence" which was released in Septmber 2014 by Cyclone Empire.